From Here To There With Grace: How should Christmas be defined? How should Christmas be defined? Some people refer to their good luck moment as Christmas. Others will say that every day is Christmas to them when good health prevails. Receiving an unexpected gift is also referred to as Christmas among some of us. Birthdays, Anniversaries, Valentine’s Day, A job well-done, and Christmas are just few of the occasions when people are favored with gifts. However, when it comes down to nitty-gritty it would appear as if Christmas is the most pronounced of all the occasions. December 25th is the actual day for Christmas and I have learnt long ago that Christians celebrate this day wholeheartedly because it is the birthday of Jesus, their redeemer. The festive air which comes with Christmas can be seen and felt from in the month of November each year. Consumers and retailers alike haggle over Christmas because it is known as the feel good season. Some people splurge in their spending and it is also a time when eating, drinking and giving gifts become common place among even the greatest nemesis. According to the Christians, Jesus’ birth is the reason for the season yet among all the merry making controversy finds its place in the midst. The concerns which feed the line of controversy are vast. 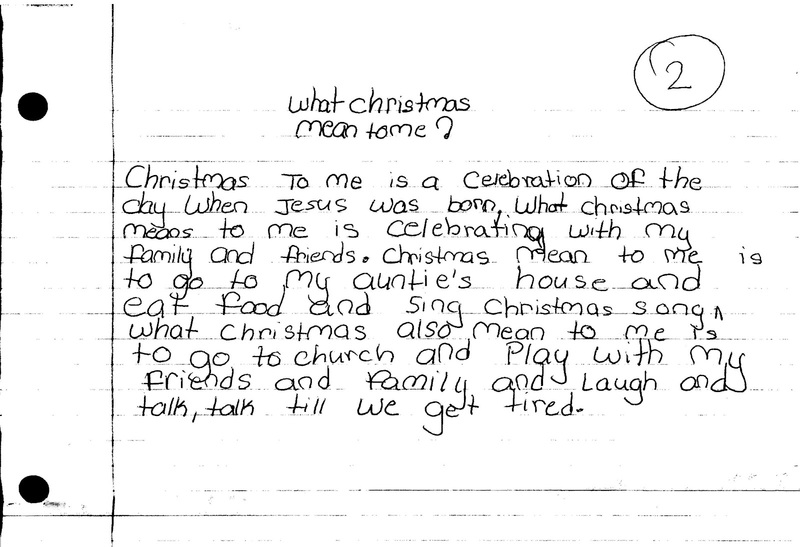 Here are a few: What is Christmas? What is the true birthday of Jesus? How could Mary be a virgin while being pregnant? Was Joseph really Jesus’ father? On this note I choose not to interfere with the teachings of old because the slightest attempt to do so would probably stir an upheaval which would then prompt me to call on the gospel brothers Matthew, Mark, Luke and John to come to my rescue. Not to mention the overly confident Goliath who would be waiting in the wings. The topic Christmas churns relentlessly notwithstanding the fact that I hold true the tiny verse which I had learnt during childhood: Christmas comes but once a year and when it comes it brings good cheer. Changes come and go and in my adult life I have noticed that the Christmas cheer comes at a high cost, mentally, physically and financially. Spending beyond means to please others can be detrimental so Christmas 2011 I budgeted; I decided not to buy any gifts. This sounds horrible especially considering that I have grandchildren. 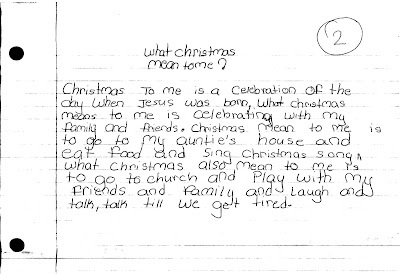 Nonetheless, I kept my word and came up with a plan that would still keep a tiny amount of the Christmas cheer alive.
. That plan was in the form of an essay competition among the children of some of my Brooklyn neighborhood people now turned family friends. A fabulous incentive was affixed to this competition. It was also necessary to ward off biased behavior by the judges. Therefore numbers were used on the competitors’ works instead of their names. 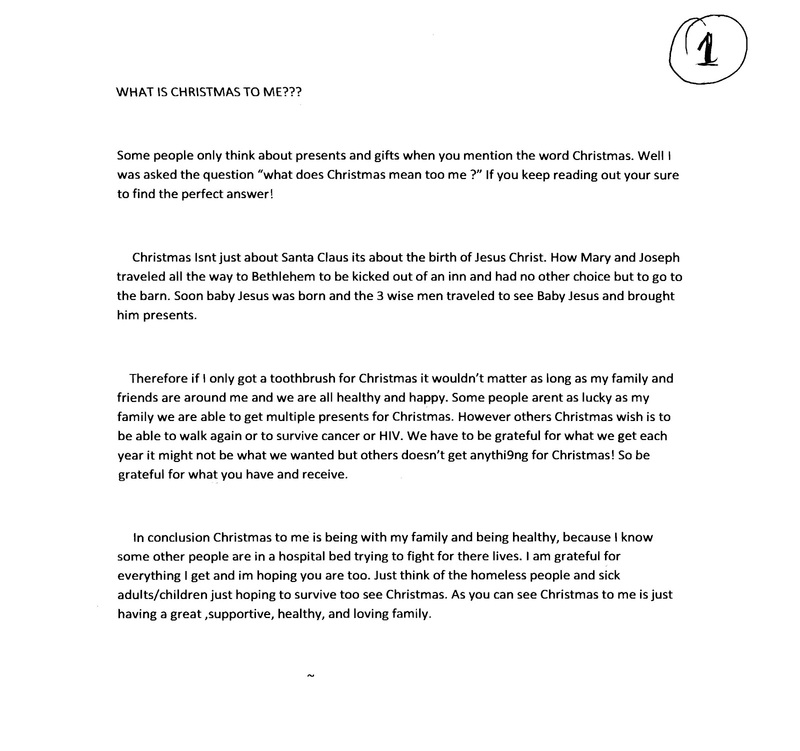 The topic of the essay was “What does Christmas Mean to me”. I took into consideration the controversy and gifting that surrounds Christmas and felt that a child’s opinion would be most welcome. Children have their own thoughts and spin on things. I am particularly impressed when their ability to censor is not fully ripened. Below you will find two essays in their unadulterated form and which made it to the top. The first place went to 12 year old Jenai and the second place to 9 year old Dasani. Heed your mistakes but most importantly don’t forget the lessons learnt.